Discounts are available for deaza G (7 deaza dG)! 7-deaza-deoxyguanosine (deaza G (7-deaza)) is a deoxyribonucleoside in which the 7-nitrogen (N7) of the base is replaced by C-H. The resulting modified dG is unable to form a hydrogen bond at position 7. In an important structural study, Seela and Driller (1) showed that substitution of 7-deaza dG for dG in both the hexamer CGCGCG and its complement resulted in a Tm for the DNA duplex formed by the two that was 9 degC lower (and thus less stable) compared with that formed from the native sequences. 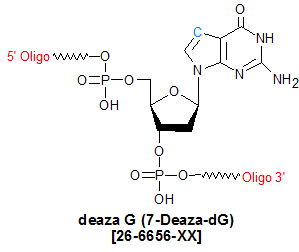 For a single asymmetric base pair 7-deaza-dG : C, the reduction in stability is about 1 degC compared to the native G : C. This property can be used to reduce structural problems posed by G-rich and GC-rich regions. Because such regions can form both intra- and inter-strand non-Watson-Crick hydrogen bonds via the N7 of the G-base, they can form highly stable secondary structures (such as G-quadraplex) that effectively prevent generation of PCR products (or even readable DNA sequence) from them (2). Substitution of 7-deaza-dG at certain dG positions in G- or GC-rich oligos slated for use in PCR as either PCR primers or templates reduces the thermodynamic stability (and thus the prevalence) of these secondary structures, resulting in improved PCR product generation (3). 1. Seela, F.; Driller, H. Alternating d(G-C)3 and d(C-G)3 hexanucleotides containing 7-deaza-2�-deoxyguanosine or 8-aza-7-deaza-2�-deoxyguanosine in place of dG. Nucleic Acids Res. (1989), 17: 901-910. 2. Fernandez-Rachubinski, F.; Murray, W.W.; Blajchman, M.A. ; Rachubinski, R.A. Incorporation of 7-deaza dGTP during the amplification step in the polymerase chain reaction procedure improves subsequent DNA sequencing.DNA Seq. (1990), 1: 137-140. 3. Han, H.; Hurley, L.H. ; Salazar, M. A DNA polymerase stop assay for G-quadruplex-interactive compounds.Nucleic Acids Res. (1999), 27: 537-542.